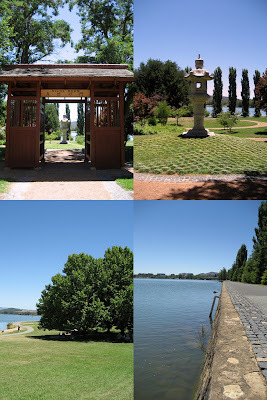 Canberra might not be the most obvious holiday destination, but we always have a great time up there. I love the lack of traffic, the abundance of cafes, the many green parks. 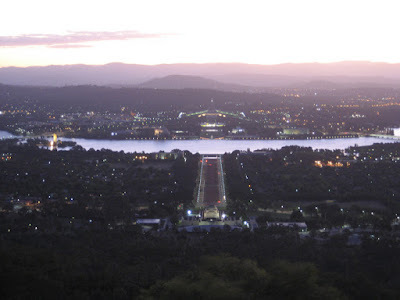 Yes, it's very quiet, some might say boring - comedian Ed Byrne described Canberra as Melbourne's retarded cousin - but I do not take this harsh view. I don't know if I could live there, but for a weekend away, I love it. A short explanation is necessary, I feel, because I am sure no-one outside of Australia has heard of Canberra. Canberra was purpose-built as our capital in 1913, as a compromise between Sydney and Melbourne. It is home to Parliament House, the High Court and other government agencies. It is a very small city, with a population of 340,800 (source). It is situated in a teensy-weensy little state, the Australian Capital Territory, which itself is situated within New South Wales. 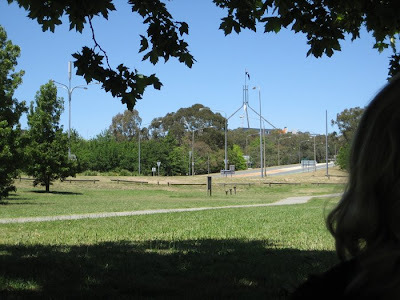 I was thrilled when I received surprise tickets for us to go to Canberra for a weekend to visit my good friend An-who-works-in-the-government. Weeks of furious back-and-forth emails ensued, deciding what we'd do, where we'd go, and most importantly, what we'd eat! First thing I organised was a foodie gift for An. 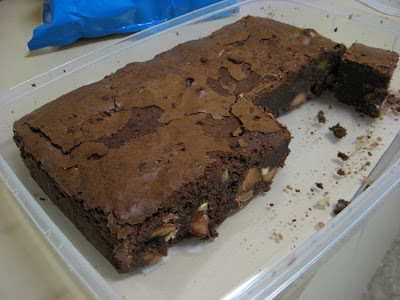 The day before we left, I made triple-chocolate macadamia brownies, adding white and milk chocolate chips to the one-pan macadamia brownies in Belinda Jeffrey's Mix & Bake. 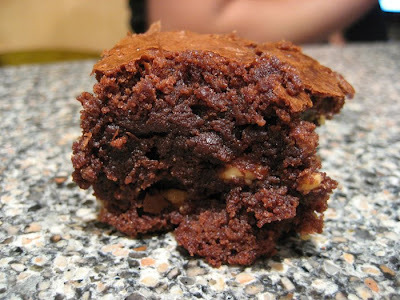 Look how fudgy they were! And the crackly top! Fabulous recipe. Next time, I'd double the quantities of nuts and choc chips, and maybe cut down the sugar by a third. They were great fresh out of the oven, pudding-style with cold cream (well, I had to taste-test them! ), and got better over time. At first I was going to cut them into pieces, but then realised they'd be more durable for transport (and look more generous!) in a big slab. There are actually quite a few things to do for food-lovers in Canberra. If you find yourself up there sometime and aren't sure what to do, the Out in Canberra website is a good place to start. On Friday night we went to Mecca Bah in Manuka. I've been to the Melbourne outlet before (see here!) and enjoyed it, so I thought this would be a safe choice. The food was good, as expected, but I found my tagine a little sour and would have preferred more carb-a-licious couscous to go with. 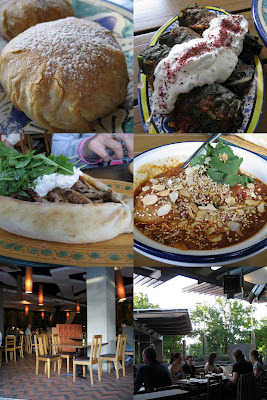 Bastilla; Silverbeet Rolls; Chicken Turkish Pizza; Chicken Tagine with tomatoes, honey, almonds and sesame seeds; the interior; breezy outdoor seating. 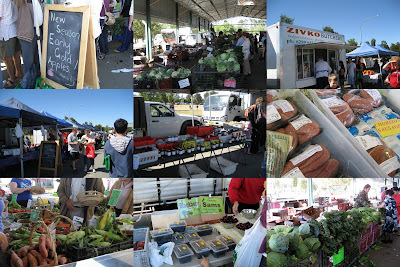 On Saturday morning we headed to the Capital Region Farmers Market at Exhibition Park in Canberra (Epic). 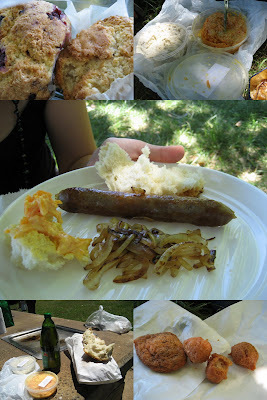 We got some amazing blackberries and cherries ($7 for a massive punnet), lattes, sausages, bread, some funky African deep-fried coconut puff things, a pork pie and a whole lot of supplies for our picnic that afternoon. We'd planned a picnic for lunch because we thought it would be cheaper than a restaurant, but we actually ended up spending more at the market than we did at Mecca Bah. Whoops. Sorry guys! And speaking of picnic... Nara Park was the location of our little picnic. In the top left photo, you will see "The Gates of Friendship". Canberra and Nara are sister cities, don't you know. Mini Pork Pie. 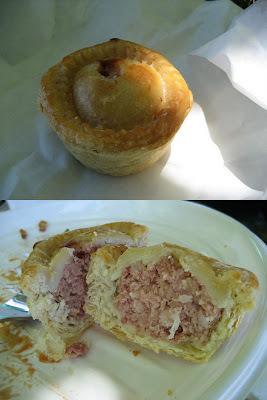 Pie Guy: "It's not a lunch, it's a munch"
More Canberrian adventures to come! You must learn how to make the pies. My friends from Canberra say they will either never go back, or cannot for moral reasons, or promises they have made to their souls. I'm not in Australia and I have heard of the Canberra!! I'm in England, and I've heard of Canberra! Those Brownies look amazing! I made Nigella's Flourless Brownies yesterday and recommend eating Brownies with warmed raspberries and cold creme fraiche...! Interesting! I have heard of Canberra, but didn't know *all* that. 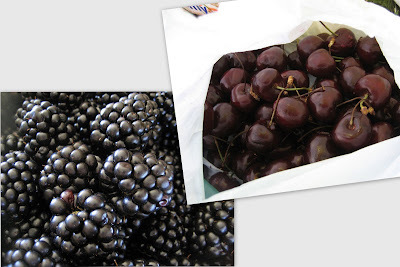 The blackberries look so perfect they look fake! All the food looks amazing! And the massive brownie must have been fab. Anyway, looks like a great weekend.